08 Feb Valentine’s Day Dinner Giveaway! Valentine’s Day is almost here. The Law Offices of L. Clayton Burgess wants to show you the LOVE! 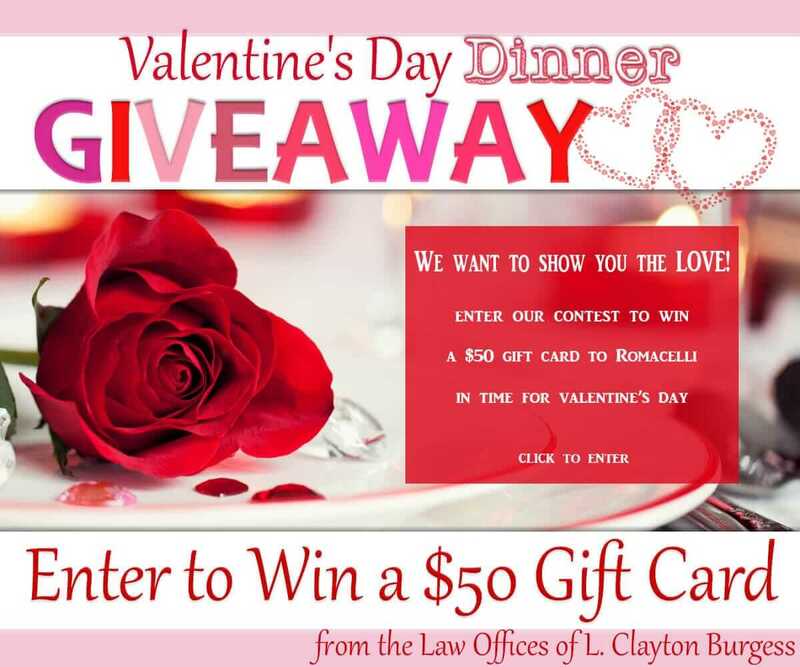 We are giving away gift cards for a fine dining, romantic evening for you and your sweetheart at Romacelli! Four lucky couples will win a $50 gift card for Valentine’s Day dinner. Romacelli serves fresh, authentic Italian-Mediterranean cuisine from (3) locations in the greater Lafayette area. Winners will be announced and contacted February 12th. You can only win (1) gift card. If you don’t claim your card before 5:00pm February 13th, it will be re-gifted.